BluesTV, the Club’s official video channel, allows supporters to access exclusive features with manager and players, behind-the-scenes content, match highlights, pre and post-match analysis and matchday live productions all in one place, on the move. Our commentary team and expert pundits for live matches this season will include Blues legends such as Dele Adebola, Kevan Broadhurst, Paul Devlin, Bryan Hughes, Geoff Horsfield and many others, including special guests. Already a BluesTV subscriber? Click here to access your content. 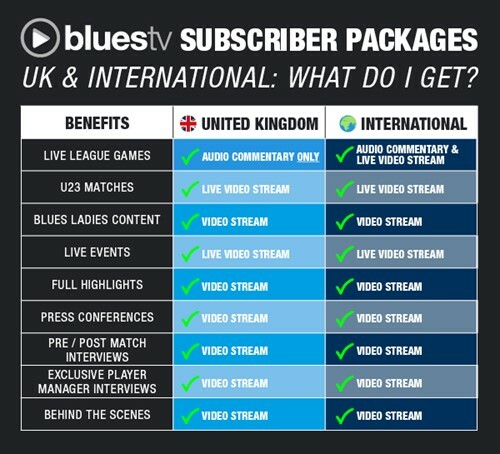 Through BluesTV we bring you everything Blues you could possibly wish for - and you won't be able to get this fantastic service providing such exclusive access and great content anywhere else. International monthly £15.99, International annual £110, UK monthly £5.49, UK annual £49.99. Our pre-match studio shows are available to all subscribers. The show commences 30 minutes before kick-off for home matches and will feature guest pundits who give their analysis on the team. Unlike many other providers BluesTV offers additional camera angles as well as more reliability with the service, we have heavily invested in new equipment to deliver a higher production value for subscribers. We offer multi-camera coverage for BluesTV home matches, which delivers angles and replays, these options were only broadcast on television last season. To read our FAQ's, please click here. Due to EFL broadcasting regulations, BluesTV is not allowed to live stream FA Cup, Carabao Cup fixtures or matches chosen for Sky Sports/Overseas transmission. Audio commentary, however, will still be available for these fixtures. To access BluesTV content on your mobile device you will need to go through the official Club app. Location services will also need to be enabled on your mobile phone or tablet in order to view BluesTV content. Please note: The Club app isn't available on either Kindle devices or Window's phones.